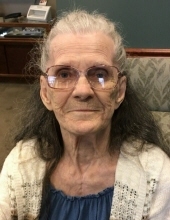 Edith Fay Campfield, age 78, of Springfield, Missouri, passed away on Saturday, October 6, 2018 in her home, with family at her side. She was born on February 1, 1940 in Taney County, Missouri, the daughter of William Clarence “W.C.” and Vica May (Goodwin) Oliver. A homemaker, Edith enjoyed spending time with her family and friends. She was of the Pentecostal faith. Edith is survived by two brothers, Thomas Oliver and Marion Oliver; five sisters, Linda Sissney, Lydia Stapp, Alma Jennings, Janice Hicks, and Cora Cron; numerous nieces and nephews; and a host of extended family and friends. To send flowers or a remembrance gift to the family of EDITH FAY CAMPFIELD, please visit our Tribute Store. "Email Address" would like to share the life celebration of EDITH FAY CAMPFIELD. Click on the "link" to go to share a favorite memory or leave a condolence message for the family.